Five years ago, when Robert Shutts (see photo above, top right) arrived at the Ohio home where his sister and her kids were staying, he entered the room to find chaos. His sister was intoxicated and incoherent, her three toddlers unattended. “It was a horrible sight to see," he recalls. “My sister was just laying on the bed, puking her guts out. Two of the kids had no pants on, no diapers. It was filthy." He'd received the call because her temporary hosts planned to notify Child Protective Services of the situation but thought to call him first. It was a familiar story to Robert: he and his sister had been removed from their home as children and later adopted by family members. Perhaps for that reason, he'd been in denial about the severity of his sister's problem. Robert was studying to become a medical assistant and his sister lived near his school. He often stopped by to see her and his nieces and nephews after class. He would notice the needle marks on her arms, but she would persuade him that she was done and seeking help. Now, it was clear she was not fit to care for her children. Robert felt obligated to help despite his heavy load at school. What's more, he was eager for more connection with family, having lost contact with the remainder of his family after coming out in his teens. “These kids are actually all that I have left. My family doesn't care about me," he says. “When I came out to them and told them I was gay, they didn't want anything to do with me." Fearful of someone contacting authorities, Robert's sister agreed to let Robert care for her children. “She knew she was on the edge of losing everything," he says. 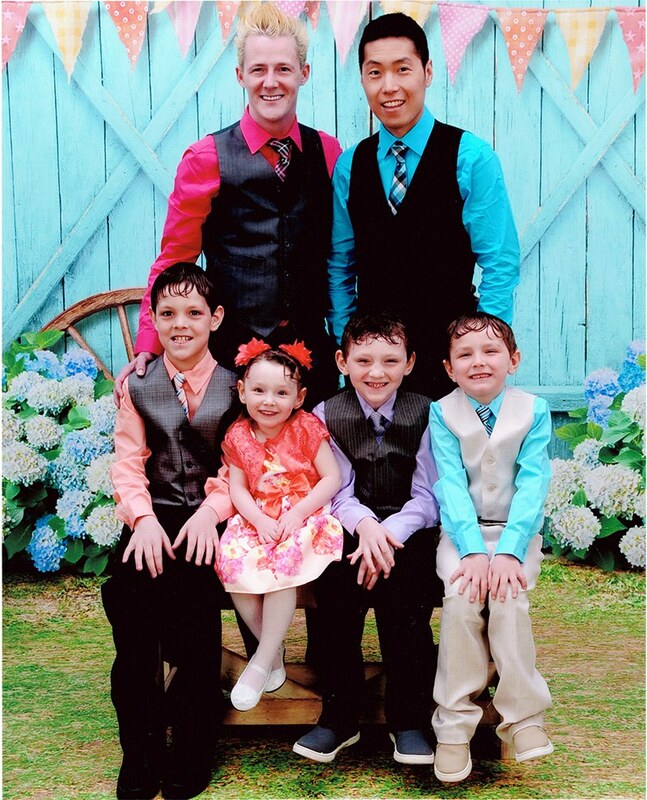 Suddenly, the 25-year-old student was dad to three boys, Preston, Aiden and Isaac. He became their foster parent to pave the way for adoption. With three kids under five years old, Robert graduated with honors. In 2012, two years after discovering his sister and her children in squalor, Robert received a phone call from her out of the blue. “My sister got a hold of me to inform me that she was in rehab and she was doing a really good job and she wanted to see her kids," he says. Though he'd had every intention of adopting the kids, Robert made the heart-wrenching decision to give her a second chance at parenting as soon as she was ready. She wasn't. “She relapsed the minute she got out of rehab," he says. Soon, though, she contacted him again — this time, pregnant and serious about getting clean. She moved into the home where he lived with the children. “She was going through withdrawals," he says. “I had to take her to a special clinic to get methadone to wean her off heroin." She finally achieved sobriety and Robert followed through on his resolution to return the kids to her care. Still, he provided for them as much as possible, renting and furnishing a home for them. Suddenly childless, Robert felt lost. “I was starting to have a crisis myself — I didn't know what I was doing with myself," he recalls. So he moved to Texas. He was making plans to move to Hawaii with a friend just six months later when he took a quick trip back to Ohio to meet his newborn niece, Payton, his sister's fourth child. “I drove all the way up to Ohio in April of 2013 to knock on the door, and discovered that my sister was really still on drugs." This time Child Protective Services was already involved. Robert was faced with a decision: reclaim custody of his sister's kids or see them enter the foster care system. Relinquishing dreams of living his remaining twenties in Hawaii, Robert once again became a dad — this time to four kids instead of three. Tight on money, he and the children entered a homeless shelter until he could find work — his externship after school offered him a position — and find a new home for himself and the kids. “Finally I got me a nice place and met me a nice gentleman," he jokes, but his relief after such tumultuous years is palpable. “I'm amazed, to be honest. When I met him, I didn't think he was going to be so interested in being a family man." Robert and his gentleman Matthew recently bought a house together and co-parent their four kids, now aged 3, 6, 7 and 10. “I have people telling me I've been really busy and they have no clue," he laughs. “They think I've been really busy in the bedroom department." From Neil Patrick Harris to Ryan Murphy, more famous gay men are having kids. Academic duties aside, the college years are not necessarily a time of great responsibility. Between spring breaks and frat parties, they're basically adolescence with a beer budget. But when Frankie Presslaff was still an undergraduate, he found himself undertaking the greatest responsibility of all, fatherhood, under the most intimidating of circumstances: He wanted to adopt, and rescue, young brothers being raised in a deplorable drug den. And he fought tooth and nail against skeptical, discriminatory state agencies to do it.